Without doubt one of the hardest, most emotionally draining jobs for the average reporter is the death knock. It is not, as many critics of the Press will have you believe, a simple act of voyeurism into grief. If you believe that you are in the wrong job - many do and many leave. And if you find it is not emotionally draining than you ought to see someone about it. I've yet to meet anyone who doesn't feel that way. The fact is we do an awful lot of these and you never quite get used to them. Not once. So why do we do them? A successful death knock will stop a death becoming just another statistic. It's much harder for those in authority to dismiss numbers than it is to ignore individuals. Bland excuses can be made, figures fudged, the truth bent, things swept under the carpet. Try doing that with a real person - an individual who has experienced pain. It can also act as an obituary, sometimes but not always, something the family will want to hold on to as a keepsake. And in the meantime, you as a reporter, will be accused of all manner of despicable behaviour. You will, for your efforts, be accused of intrusion, of being scum, of being a vulture, of preying on grief, of only being interested in selling papers, of being uncaring, of being these and many, many more things. Which is why you have to believe in what you are doing, in why you believe their story could make a difference. Not only for the family, in the short and medium term, but for others in the long run. And it can make a difference. And, no, I do not believe I am self-deluding. I genuinely believe - as you should - that as reporters what we do is important and can make a difference. Of course I am not saying it will prevent all future deaths of a similar nature; but in some cases it may help highlight and focus energy on a particular area, ie a rat run, a cycling accident at a junction, an industrial accident, a murder. Also don't go making assumptions, that too is a very bad idea. Being sensitive is essential. Firstly, in order to show you are a member of the human race but also to win over a family's confidence. Despite all of this we are still there to tell a person's story. If the door is slammed in your face you have failed. I say this because, hard as it is, you should do the knock. Simply not bothering or relying on social media is a disgrace to yourself and your trade. So hopefully I've established why they are necessary. Many may well disagree, that is their prerogative. 1. Make assumptions. Each death should be treated purely on its own merits. 2. Ever say, 'I know how it must feel'. Unless you can back that statement up by talking about the death of one of your own loved ones and feel it may help in making a connection. In general avoid meaningless platitudes. 3. Rely entirely on social media UNLESS there is no other possible way of doing it. Even then ask to speak to family members in person or by phone. 4. Lack confidence. Yes, it is a nerve wracking experience for the reporter but a polite, professional manner is better than a stammering bunch of nerves, which will only make you sound shifty and not inspire confidence that you will be able to tell the family's story in a way they would want. Indeed a bad approach can and will engender distrust. 5. Be scruffy. 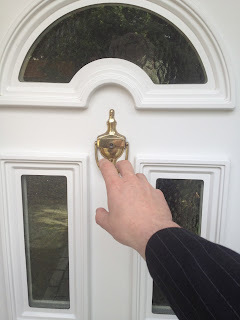 Again, you are knocking on a door unannounced, this is about showing you are a professional. 6. Go mob handed to a doorstep. If several newspaper reporters, agency reporters, photographers, camera crews and radio journalists turn up at once send two trusted representatives who can then share the information. There is nothing like an undignified scrabble to upset the family. But trust in your fellow reporters is key. 7. Rush. If a family is good enough to talk to you give them the time they need to tell their story. If you have a deadline looming do explain you have to file but be prepared to stay longer. 8. Ever offer money for someone's story. 1. Apologise for disturbing them. This is your acknowledgment that you are an outsider at an intensely personal time but avoids the impersonal platitudes (I'm sorry for your loss etc) which the family may well find odd coming from a total stranger. 2. Follow the family's wishes. But if they ask you to go away do remember to ask if it would be possible to come back at some later stage. Ask when that would be convenient. 3. Check everything you've been told by the authorities. Including the spellings of the deceased's name and age. Police and coroners can make mistakes. If this is for print then errors cannot be easily rectified. That in itself can be very upsetting. Indeed even if a family say no to an interview it is still worth asking if you can double check the details. 4. Work out what you are going to say beforehand. It will allow you to make the key points as to why you believe their story is important and will, hopefully, reduce your nervousness. 5. Establish you are speaking to an adult and, where possible, their relationship to the deceased. 6. Remember a person did not become important the moment they died. They were important to their friends and family in life. Build up a picture of that life as best you can. 7. Ask for a photograph that best sums up their life. Preferably with their family. NEXT: Building up a picture of someone's life on a death knock. For further reading see Jackie Newton excellent blog here on death knocks. And here's a personal and view from Australian journalist Sarah Harris on why they are important. And here's Roy Greenslade offering another view - note he didn't speak to the newspaper he was referring to in the story. And another Roy Greenslade piece an extract fromThe phone hacking scandal: journalism on trial is by Jackie Newton and Sallyanne Duncan. That's very kind thank-you. Please let me know if you have any suggestions.